First of all, sorry for the lack of posts recently and if you follow me on Twitter you'll be aware part of the reason is due to illness, I had a plan to smash out tons of posts yesterday but instead was bed bound feeling way too sorry for myself. So let's get on with this post, it's the fourth in it's series which so far has been a bit hit and miss with my first in the series hitting 50 views and the second only hitting 9, but I'm still going and as I'm finding more and more images I love and find inspiring. I don't think this series will be ending any time soon! I love this picture as it's very literal and relates to a lot of common sayings/quotes but has been written in a different way than I've seen before. She turned her can'ts into cans- Instead of saying "I can't do that" say "I will try and do that" even if you feel what you want to do isn't quite possible, it doesn't hurt to try. Life is about trying whether you succeed or fail, at least you never gave up. 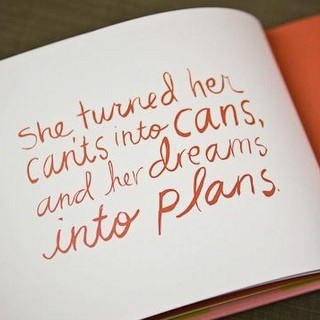 And her dreams into plans- Make your dreams reality, it's as simple as that. We all have dreams whether it's to be a doctor, have children or go to Disneyland, no matter what dreams you have you should pursue those dreams, plan how you're gonna make those dreams real.